*Lisa Marcia does not get compensated by Okkatots for reviewing their product. Just a momma bloggin' great items! As I started packing, I realized my little guy could easily have a carry-on of his own. The only problem with this is that we don't pay for a seat, therefore, no carry-on bag is allowed for him. My bag needed to become his bag. YIKES! I love all the trendy new diaper bags that look like purses, but honestly, they didn't serve the functional purpose I needed for plane travel. My needs: Easy Access. Lots of pockets. Lots of compartments. 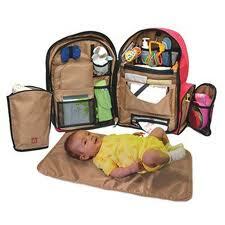 Large enough for diapers, clothes, snacks, meals, bottles, toys - basically a mini suitcase. Easy to carry. Hands free. Like a shout from the heavens, Okkatots Travel Diaper Bag / Backpack came up on my search. Mom Tip: If you sign up for Amazon MOM, it's free shipping for the first 3 months! Initial thought: A mom must have designed this. It's so intuitive and handy. Compartments galore! There is an elastic mesh pocket of every shape and size for anything you want to throw in and make sure it doesn't fall out. MY FAVORITE: The diaper organizer! Any mom knows that diapers get misshapen and expand in diaper bags, taking up more room. This backpack has a designated organizer that stacks the diapers fitting up to 12 of my Size 4 Huggies diapers. I think it's up to 16 with smaller sizes! Front compartments: easily held my wallet and all boarding passes + important docs that I needed handy. Straps are nicely padded and have a area that I could place my iPhone in (with case on!) so it's on the front of me while carrying the pack. I even carried my son in his ERGO carrier on the front and the backpack on my back thru the airport. Side mesh - held raisins and other snacks, toys, pacis, you name it! Zippers - this bag unzips ALL the way, so you can lay it out when packing and open it from any side. No searching for the right side to open it on. Hang it up! The two straps can be used to carry this by hand or hang from a clothes pole in a closet for easy access once you've reached your destination. I didn't use this feature, but left it open for easy access during our trip. Insulated pouch - this pouch held my little guy's 2 - 4 oz juices, hand sanitizer, and 5 - 3.5 oz baby foods and kept it cool from the fridge. No ice pack needed! So nice walking through security and not having to toss an ice pack! DVD or iPad holder - on the front there is a place for your electronics that keeps them safe and secure as well as can hold up a portable DVD player for viewing if you choose. For us, it also held his baby headphones for watching Toy Story 3 on the plane. Lifesaver! Hangs on your stroller! **Just make sure you are holding it as with other bags...you don't want your stroller tipping over! Weight - this backpack can get a little heavy depending on what you pack in it. For me, I'm 5'6 and had a 20lb baby on the front of me and this backpack and was fine. It got a little heavy after a while, but nothing crazy. Lack of waist strap - this coincides with the above comment. Just like a good baby carrier, I think a waist strap would take some of the weight off the shoulders and distribute it more evenly. On Planes: If fully stuffed, this bag does not fit under a plane seat, but fits easily overhead. If you don't pack heavily, then it fits just fine for me! Price: Honestly, I put this in the Cons, just because I believe some people will see it this way. But, if you search quality diaper travel backpacks with everything this one offers, you won't find one any less expensive or better quality. In this department, I've learned, you get what you pay for! 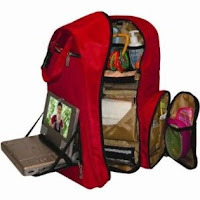 The Okkatots Travel Diaper Backpack is a great companion on travel trips either by plane or car. Honestly, I want to take it everywhere with me as my new diaper bag when we're out and about. I would recommend this product to all moms who have multiple children as well. It organizes everything neatly for easy access. When I need to grab something with one hand, it's there; In the spot I would place it. Again, it's larger than a normal diaper bag because it is for TRAVEL. There is a smaller backpack probably for everyday, but this suits my everyday. Just the diaper organization and insulted cooler (you don't have to bring a separate lunchbox!) sold me. I got mine it Red, but they also have a gray as well for a more neutral color if you desire. To buy the Okkatots Travel Diaper Backpack Get it Here on Amazon <---- Cheapest Place I have found to date!